Garvald Edinburgh is a charity and the bakery is based in Gorgie Road. It provides valuable opportunities for people with learning difficulties. 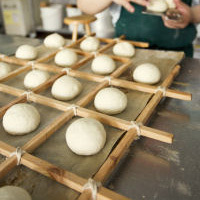 Each loaf is organic hand kneaded and contains no anti mould ingredients. Only the wholemeal and white loaves are available Monday and Tuesdays. We’ve started ordering all the Garvald bread on Sunday night for the week.